As I caroused the Internet today checking for the latest and greatest in nail enamel options I stumbled upon two cool launches that were both worthy of sharing. 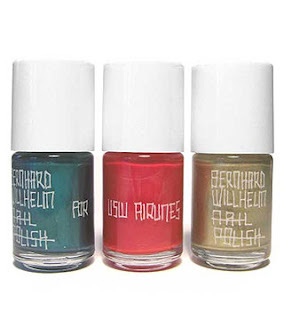 According to British Vogue, UK based cosmetic company USLU Airlines has teamed up with French designer Bernard Wilhelm to create a funky line of polish colors named after famous international airports abroad. From MBX (Maribor Slovenia) to BEY (Beirut International Lebanon) and available in 6 awesome colors it's the easiest way to get your trans-Atlantic fix. Polishes can be purchased at http://www.usluairlines.com/ or http://www.uslubw.blogspot.com/. Prices are in Euros, but polishes are about $35 a pop. By now we have all heard that the CW is creating a spin-off of the famed 90's TV show Beverly Hills, 90210 and as briefly told to the world by NYLON Magazine, our beloved friends at OPI have decide to launch a limited edition line of polishes after the old crew. I can only imagine what types of names the colors will have; maybe even Prudy Petudy Donna will have a tout - and we would hope so considering how the real life Donna is vying for her piece of the re-creation pie. Details have been a bit mum on this front, but I'll be sure to post an update as soon as more informacion becomes available :). So I looked down at my nails this afternoon while writing up this proposal at work and to my dismay it appeared as if a tractor trailer (OK I know I am exaggerating) ran over them~! Uneven, slanted on the right, chipped on the left side on and on ~ just a hot mess. I pulled out my file and buffer to immediately rectify the situation and for now it will have to suffice; until my Friday ritual of a Manicure and Pedicure at Nails and More on 98th n bway. Carry a mini nail file and buffer with you at all times -that way you can be sure to maintain a beautiful nail appearance and repair snags and chips like a professional. Try a coat of clear polish once a day. This will keep nails strong to minimize breakage and a little bit of shine doesn't hurt either. Push cuticles back to create cleaner lines on the nail bed. Trust, it will help nails to appear much neater. Moisturize cuticles to prevent the skin from breaking. I myself missed my own tip and failed to put a clear coat on once I removed the color. Just make sure you follow the above and don't make the same mistake. Welcome to Nail It 10 ~ your one stop shop for all there is to know about your 10 fingers and your 10 toes :). Being a nail fanatic and knowing that there are a plethora of women out there just like me, I decided that the best way to share my desire and obsession to the world was to welcome you into my nail psyche via a blog. You'll be exposed to my frustrations and my elation with my favorite past-time polishing my nails and toes. I also want the world to understand that Nail Art as I like to think of it, is not a second thought. It's something that accessorizes our entire look, it can make or break the way we feel about our day. If my nail is chipped or if I find a snag, I'm pretty bummed! I want to draw the comparison between nail art and fashion and provide the world with wonderful options to pulling it all together, making it all work! Of course i'll do the regular stuff like review product, nail salons, provide great tidbits and more, but my desire and aim is to provide that "aha" moment where you found the one thing that was missing-and I think that one thing is 2 coats of Lincoln Park After Dark any day! :). I hope to show you great fashion show coverage and behind the scenes in beauty - a look into exactly what happens and how much thought goes into the beauty/looks and trends of the season; plus there may be a few other exciting things posted for your reading pleasure - like great sales hello SAKS, BARNEYS, BENDEL. OK let's get started. Enough about what's to come. Here goes!